It was 53 already when I got up - isn't spring wonderful! The crocuses are flowering under the cedar tree and the daffodils, at least the established ones, are showing flower buds. The bulbs I planted two weeks ago are just poking above the soil. I spent most of the day outside. I'm digging a trench 18" deep along the edge of the upper garden to install a barrier of landscape fabric - my Maginot line to fend off the invading hordes of morning glory (Ipomoea) roots. Unfortunately I tweaked my lower back while digging so that project may have to be postponed. I sawed another couple of Lucas Creek agates and filled in the trenches left by my efforts to get the car out of the garden. While I was doing that I spotted the red-breasted sapsucker tapping the vine maple in the goat's pen I ran inside to get the camera but of course the bird had flown by the time I got back out so I sat out back for an hour or so and managed to catch a towhee sunning and our resident golden-crowned kinglet flitting. While waiting for the kinglet I caught a glimpse of the white-throated sparrow again so it's still around, as are several varied thrushes, two fox sparrows, two or three golden-crowned sparrows and a small flock of evening grosbeaks. Ravens, increasingly common, fly over almost daily, sometimes escorted by crows. We've also had two new yard birds in the past two days; a merlin perched briefly in the top of one of the Minnick's firs, and two bushtits were pecking at a suet feeder yesterday. For exercise I walked down to the river today, figuring a walk might help my back. The channel has shifted since the high water a month ago and a good-sized gravel bar has formed on the near side of the river. Once in a while the Green River produces a nice agate so I've been wanting to check it out. I took the camera too, in case I came across any interesting images. The gravel bar was barren. So were the more extensive new bars on the far side of the river - not worth freezing my feet for. I searched for an hour and appreciated the solitude while I wondered what to do next. Though I found neither agates nor answers to my questions, I did find a few photos, of cobbles and maples and moss. It is the season for ferns and moss. They revel in the light and moisture of early spring; once summer brings leaves and drought the ferns and moss go back into hibernation. I finished re-laying the bricks over the sewer line cleanout today. It was fairly pleasant outside so both Susan and I did a little gardening. She planted phlox in the plot in the center of the driveway and I put the tall white roses she bought last week at Costco into the big pots on either side of the garage door. At the Friends of St Thomas meeting they're discussing The Shack so I emailed Pastor McClarty to see if he had an extra copy that I could borrow. He brought it over this afternoon, and commented on a couple broken geodes that I'm using to hold down a black plastic tarp in the driveway, a weed-control project. It turns out that Pastor McClarty likes collecting rocks; I wish I'd known that a month ago, when we were finding the spectacular agates in Lucas Creek. He'd have enjoyed that. Although we didn't make it either to the meeting at the Academy church, or to the Friends of Thomas meeting, I did read the book this evening. Made my eyes water even more than hay fever does. I want to take another look at some of it since I went through it pretty quickly the first time - I liked the characterization of God but didn't make much of a personal connection. I'm hoping that by re-reading it I can gain some insight into my own indifference towards God. We had a little snow yesterday evening then around midday a prolonged heavy snow shower dropped about 2", half of which melted away later in the afternoon when the sun came out for a while. The snow concentrated the birds around our feeders so I went out several times with the camera and succeeded in getting my first photos of the evening grosbeaks. nervously before returning to the tree top, and soon after that the whole flock left in a commotion of wingbeats and calls. millet both at the feeders and on the ground. In the past few weeks they've begun singing and squabbling more; I guess their hormones are ramping up for spring. While I was standing near the feeder trying for a photo, the consistency of the snow changed and large clumps of flakes began to fall. One such clump fell right on the back of one of the juncos, like a saddle blanket, and stuck for a brief moment before sliding off. I kept watching for it to happen again, hoping for a photograph, but the best I could get was this shot of another junco with snow on her? forehead and tail. David came home yesterday evening and stayed home today to work on a paper for one of his classes. It was nice to have him around. I made guacamole for lunch and Swee fixed a delicious meal of refried beans, red cabbage and rice for supper. Three or four inches fell overnight and into the morning, carpeting the field and coating the trees, then the sun broke out from a bright blue sky. The bright sunshine gleaming on the new snow reminded me of sunny winter days in New Hampshire. Later in the afternoon another band of showers moved through from the north and dropped another inch of snow, the last of it according to the weatherman. I worked on our finances in the morning and took a few more photos in the afternoon. The good news is that though our investments are down another 20% since the beginning of the year, we're still OK even if I'm not able to find work right away. Before supper I did a core workout, my first since I tweaked my back a week ago digging up morning glory roots in the garden, back when it felt like spring. It felt good to be back on a trail crew again. I arrived late but was able to follow the prints of hiking boots in the snow to find the work site. I recognized many of the crew from working together back in December in O'Grady park, and they remembered me too, which was nice. It was also nice to be able to read my fellow workers' names on their hard hats. When I arrived everyone had paused to watch a black-tailed doe browsing on salal but we soon got to work grading and hardening a new section of trail about a half mile in from the parking lot. I ended up on an apparently endless pit of duff, and when I did finally dig my way to the bottom of it I found an underground stream so at the end of the day, my trail looked worse than when I started. Mike threatened to save it for when I returned but I won't mind if he doesn't. I wasn't the only one relieved when he called it quits a little early; I'm a bit out of shape for digging and Paul next to me commented several times that he didn't have any Oomph today. Back in the parking lot the hot cider and raspberry muffins were delicious, and the companionship and sense of accomplishment were satisfying too. I worked with Molly, Sue and Lauri to dig a ditch on the upslope side of the trail, partly to intercept underground seeps which would eventually make the trail soggy and partly to collect rocks which we used to harden nearby sections ofthe trail. It was fun, particularly after lunch when I got to play in the little stream running down my section of the ditch. On the way home I stopped at Landsberg for a run. Before running I returned a call to Kathy at King County regarding the permit fee for using the Snoqualmie Valley trail for the Light at the End of the Tunnel Marathon. The fee is the greater of $1.40 per runner or 20% of the gross receipts, which for 100 runners at $50/runner would be $1,000.00. I'd have to raise my price for the marathon by $10 to cover the King County permit for running on just 5 miles of the trail. Then of course, I'd owe an additional $2/runner to King County for the increase in my gross receipts as a result of charging more to cover the King County permit fee. And an additional $0.40 on that $2, and an additional $.08 on the $.40, etc. Basically just tack on an additional 25% to whatever I would otherwise charge for the marathon to cover the King County permit. That's just not right, in my opinion. There is a possible workaround. If the marathon benefits a charity, I'd be more likely to win an exception allowing me to pay King County just the $1.40 per runner. Washington Trails Association would be a good candidate for the charitable beneficiary. Not only does King County benefit from their trail maintenance services all winter long, but many of the runners in the marathon also use trails maintained by WTA. I set out down the trail (itself another rail-trail maintained well by King County) with the idea in the back of my mind that I might be able to put in the 18-miler that I didn't get around to doing yesterday, and which I've been trying to do since last Sunday. I didn't have any water bottles and could only find one Nutrigrain bar stashed in the car so I wasn't particularly well equipped. On top of that I'd spent most of the day digging a big ditch and I was already tired and a little sore in the hamstrings and lower back. But when would I get motivated to do 18 miles if I didn't do it now? So I did. The first six were fairly easy, the next six not too bad, but the last six, and particularly the last two, were difficult. With my frequent walk breaks (every 300 steps in the final mile), I barely managed 12 minute miles but I did manage to keep my shin tendon from blowing up and my IT band from seizing up and my hamstrings and right heel never did get any more sore than they were when I started out. I finished at dusk and was wiped out all evening but felt great knowing that if I can run 18 after a day of trail work, I can surely finish Boston five weeks from now. Finished up a number of rocks today. The last step is pressure-washing to remove the buffing compound from fractures in the face of the rock. The compound traces even the finest cracks in white, generally not an effect I want in the finished piece. Over the past week I've worked through much of my backlog of rocks awaiting buffing, including two Friend eggs from last summer, several Red Top nodules from the summer before last, some Richardson's Ranch eggs from 2006, a pair of small bookends from Saddle Mountain and some recent pieces, big and small, from Lucas Creek. Cold wet weather brought birds to the feeder today. I sat on the corner of our covered back deck in my down parka and photographed the birds as they came in. 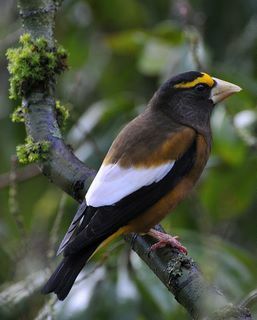 Mostly I photographed the evening grosbeaks because they are so colorful and engaging. After a while I started recognizing individuals, the males by the pattern of the yellow stripe above their beak and eyes and the females by their malar stripe and wing patterns. Young males have more mottled wings than the adults - white spots and edges on the dark feathers and dark smudges on the inner white secondaries. I think we have at least a dozen different individuals though never all at once. I'd already managed to guess her identity. The siskins are getting pretty feisty, squabbling with each other and displaying aggression towards other visitors at the feeder. They usually manage to displace the juncos and don't hesitate to threaten house finches and even the grosbeaks, though they don't usually win disputes with those larger birds. Their threat display consists of crouching and spreading their wings halfway. The one in the photo is apparently taking a break from the action. With the market still down and no prospect for work soon I was feeling particularly poor this evening so we didn't bid on anything expensive. No condo on Maui or up at Crystal Mountain this year. Susan bid on a few small items and won one, something for the boys, I think. On the Fund-a-need, we waited until the last request, for just $100, to raise our paddle. The meal was OK. The coral reef themed decor on the other hand was very well done. Inflated jellyfish floated over our heads and clumps of balloon coral sprouted all around. We'd purchased tickets for Daniel and David but only David could make it. I suspect he would have found it pretty boring had he not been able to persuade Mai to join him. Today was my first race in six months. I hadn't been planning to run the Mercer Island Half but a week ago Jeff Poppe emailed me asking if I was planning to run so I signed up, figuring it would be fun to see him again and OK to run a shorter distance somewhat hard instead of a long run. I'm glad I did. The weather was cool and cloudy with a hint of rain now and then. I found my place in the 9:00/mile vicinity of the starting pack but picked up the pace within the first mile, despite feeling pretty clunky, and averaged 8:30 for the first 3 miles. In the middle section I picked up the pace a little, peaking at 7:40 for miles 10 and 11, then slowing back down again despite pushing fairly hard in the last two miles. I never did see Jeff during the race; he finished a couple of minutes ahead of me. Ran with Betsy Rogers and her husband briefly around mile 7 I think. At the finish my HR reached 183, the highest I've seen since hitting 184 during the Skagit Flats marathon last September. It felt great to run hard again. After the race I phoned Jeff, found out he was already on his way home. After some dithering about whether I invite myself over to his house again, I drove over there and really enjoyed myself, sitting in their kitchen talking with Jeff and Anita, drinking a latte and eating a few leftover pancakes. Jeff is running Boston so we made tentative plans to meet for dinner before the race. aspects of the data model during my run along the Cedar River on the way home. It will be a good way to refresh my skills and get started back in contracting. Along the Cedar River at Landsberg the sun was almost shining and the air was almost warm, considerably more pleasant than the cold overcast with occasional rain or even snow that we've been having recently. Back at home I planted the third yellow rose along the deck off the bedroom. About 15" below the surface the substrate is the original semi-lithified mudflow the color of, and nearly as hard as, concrete. I chopped out the poplar roots, flipped the sod onto the hardpan, mixed compost into the subsoil and laced the mixture with granules of rose fertilizer so maybe the roses will do OK.
into snow by Saturday morning but fortunately the road was still clear for our drive up. A fire was burning in the fireplace and the lights were on when we arrived - rustic, cozy and welcoming. We awoke to snow filtering down between the tall firs. About an inch had fallen when I went out for a run up 410 into the park. WSDOT has plowed as far as Cayuse Pass, getting a jump on the spring though the hard part, up over Chinook, will take another month or more. The snow along the road and in the woods was generally around 3' deep. It was nice to run without traffic, just the tall trees, the gently falling snow and an occasional glimpse of the White River, low and clear this time of year. By midday when we set out to build an igloo several inches had accumulated. The plan was to try out the Ice Box igloo-building tool I bought over a year ago but never got around to using. We all started out working on it but four of us - Selina, Sage, Jeff and I - ended up building the bulk of it. David took photos (these are his) and Daniel left early to drive back down to Enumclaw to pick up Hannah and two friends of hers. Hannah's car isn't good in snow so they had gone only a short distance past Enumclaw before they had to turn back. The Ice Box worked very well for us. Although it took us about 4 hours the end result was nearly perfect, far more elegant than any hand-built igloo or snowcave I've ever made. Sage and Selina even spent the night in it. Daniel was able to get down to Enumclaw to meet the girls in the Safeway parking lot but their return was delayed by an accident which closed highway 410 for a couple of hours. When Hannah asked the policeman at the Enumclaw roadblock when he thought the road would open again he replied that he wished it could stay closed all winter. "Every winter someone dies on that road, and there's nothing up there worth dying for", he said. They finally made it back to the cabin around 9PM. We ate a late supper and sat around the fire late into the evening. Sunday morning the kids had a snowball fight and we all trekked over to inspect the igloo. It had hardened up enough that I was able to climb up on top. Daniel side-stepped up it on his split board and jumped off. He shuttled the girls back to Enumclaw then returned and took the rest of the kids back to UPS in the Subaru while Susan and I finished packing up the van. The sun had come out so the road was bare and even partly dry for our drive home. Dennis next door reported that we'd had an inch of snow on the ground Sunday morning. I ran a comfortable 20 miles today at close to a 9:00 min/mile pace including 30-second walk breaks every 5 minutes. I felt light on my feet almost the entire way, though towards the end my left shin began to get a little stiff and sore at times. Providing the soreness clears up quickly, running a good 20 means Boston might not be too bad after all.